Ever since the samples of Pulo Philippine Cuisine’s award-winning marinades and sauces arrived in my kitchen, my gourmet taste-testing son has been anxiously awaiting a unique dinner experience. Philippine cuisine fuses Asian and western tastes from Malaysia, China, India and Spain. What sample should we try first—lemongrass, mango chili, pineapple tamarind, peanut or coconut? Soak bamboo skewers in water. 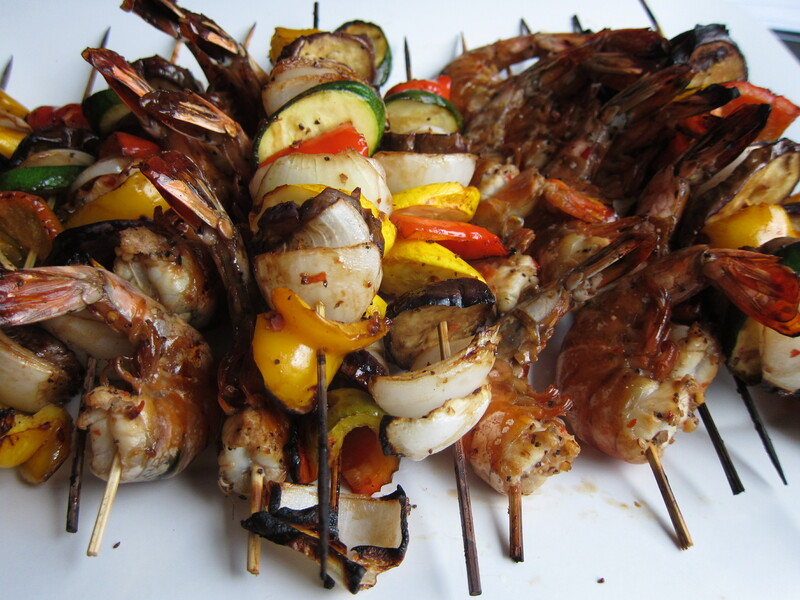 Marinate vegetable and shrimp in pineapple tamarind marinade for 30 minutes to an hour. 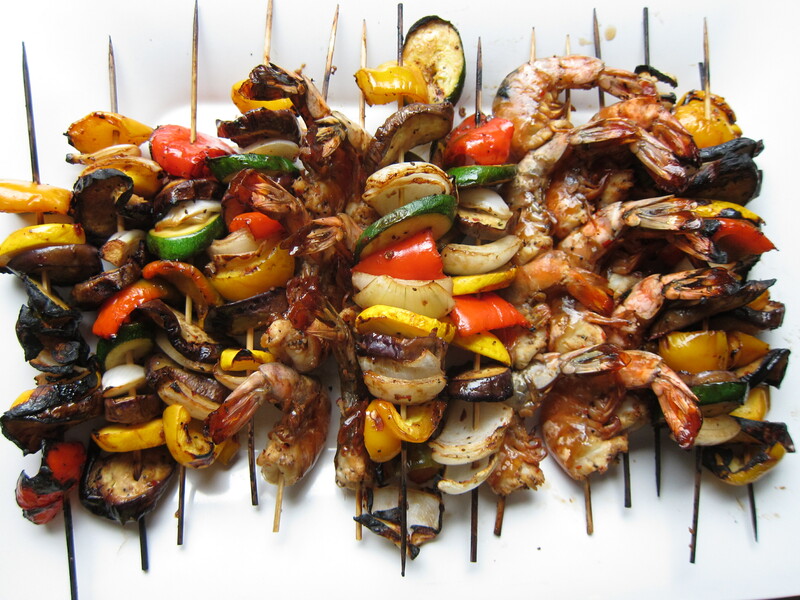 Thread vegetables and shrimp separately onto skewers. Heat marinade before reusing to baste. Preheat BBQ on medium heat. BBQ vegetables, turning occasionally, and basting with leftover marinade at half-time for about 10 minutes until they are charred. Or, you can start, finish or roast them in a 400F oven if that’s more convenient. Barbecue the large shrimp for 4-5 minutes per side, until just cooked through—only 3 minutes per side if peeled. You’ll know they’re cooked when the inside goes from translucent to white. Shrimp can also be cooked in the oven or on the stove as long as you are careful not to overcook them. Serve skewers on a bed of brown rice vermicelli or Shirataki noodles. 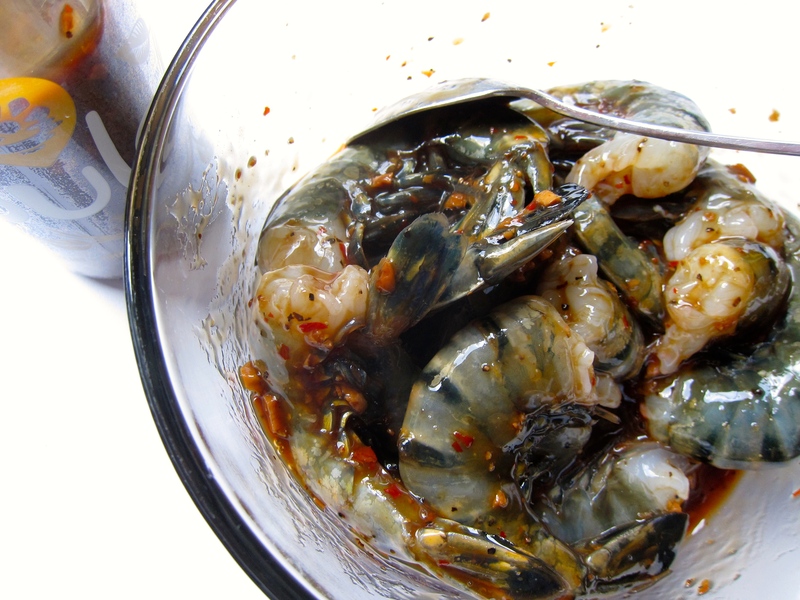 Keep the bottle of Pulo marinade handy. You’ll enjoy the bold, intense, sweet ‘n sour ‘n slightly spicy dipping sauce. Serves 4. 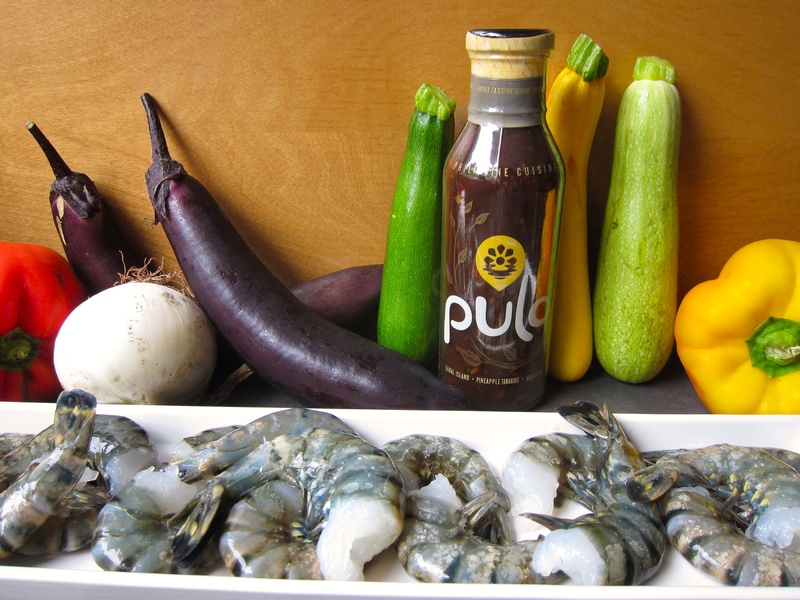 Pulo Philippine Cuisine, based in Vancouver, recently won the Retail Council of Canada’s Grand Prix Award for best new sauce in Canada. “Pulo”means island. Did you know that there are over 7000 islands in the Philippines? Now that you know the best sauces and marinades for home cooked Filipino food, betcha’ want to know the most popular Filipino eateries in Montreal. Will I be seeing you @tkrestobar? Four Pulo bottles remain. Can you give me one good reason for sending you a bottle of Pulo Philippine Cuisine marinade or sauce—puh-leas? If you’re impressed…that’s a good sign. Love shrimp. You also introduced me to a new sauce. Jovina, you’re the best! Thanks for all the support and glad to be introducing you to new sauces! your new website look is terrific! Very polished ! and the photos look even better than ever! (Andrew?) Since I live far away from civilization where the only things I can find to eat are the things I can grow I know my eating experience would be greatly enhanced by a bottle of this stuff. That is my sad story and why I need this sauce in my life, lol. Phew! I’m ultra jittery about the new look. Thanks for letting me know you approuve! Will put you on the list for a chance to win a sauce! I notice you have moved from wordpress, can you please tell me how this move went for you and if you don’t mind, why you moved? I am so fed up with wordpress and their stupidity, I want to move very badly. I don’t have much to say about that. I’m still with WP, just moved from .com to .org – self hosted. I did it to be able to get better google results. Can’t say I really know what I’n doing yet. There’s so much to learn and so many kinks to work out. Am always keen to try something new….am a big fan of your site and would love to try the sauce! Toby! So nice of you to say. You are on the list. Someone will get lucky! Thanks for making my day!! !